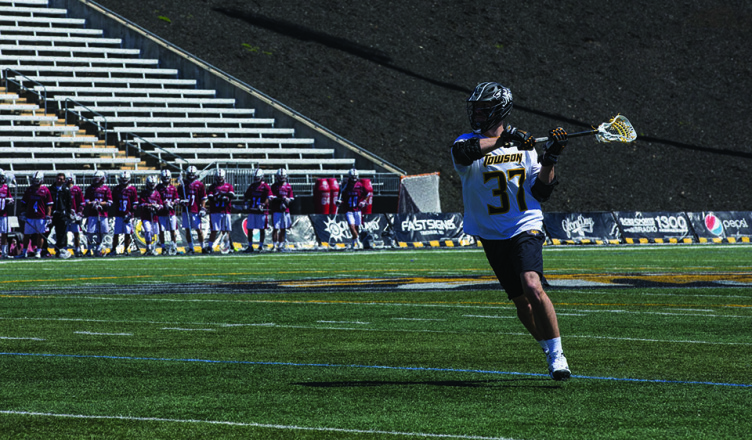 Towson picked up an 11-8 win over Colonial Athletic Association (CAA) opponent University of Massachusetts, Amherst Saturday at Johnny Unitas Stadium thanks to a six-goal second quarter. The Tigers opened by scoring the first six goals of the game. During that run, five different Tigers found the back of the net. Sophomore midfielder Jon Mazza got the run started for Towson with an unassisted goal from the edge at 6:32 in the first half. The Tigers doubled their lead during a man-up opportunity with two minutes left in the first quarter. Senior attacker Ryan Drenner registered his first of four assists when he found redshirt sophomore Dylan Kinnear in front of the crease. Kinnear buried the shot for a goal. Kinnear scored again just under a minute into the second quarter to give Towson a 3-0 lead. This time, senior attacker Joe Seider picked up the assist. The Tigers went on to score three goals in four minutes to take a 6-0 lead over the Minutemen. Seniors Matt Wyllie and Mike Lynch scored with 13 and 10 minutes, respectively. Junior midfielder Cole Robertson capped off Towson’s run with just over nine minutes to play in the first half. However, junior attacker Gianni Bianchin scored an unassisted goal to put the Minutemen on the board. The Minutemen scored two more goals in the half, both coming from redshirt senior midfielder Dan Muller. Before the end of the first half, Drenner set up two more goals for Towson. Drenner found Lynch for his second goal of the day before connecting with Seider with just under 1:30 remaining in the first half. Towson’s offensive attack allowed the team to take an 8-3 lead into the second half. In the second half, senior midfielder Brian Bolewicki gave the Tigers a 9-4 lead with a behind the back shot that went into the upper 90 of the net. The Minutemen scored on a man up opportunity to make it a 9-5 game with 6:48 left in the third quarter, but Seider netted his second goal of the game to put the Tigers on top 10-5. In the fourth quarter, the Minutemen pulled within three goals of the Tigers with eight minutes left to play. However, sophomore midfielder Zach Goodrich added an insurance goal for Towson by scooping up a ground ball and firing a shot into the back of the net. Goodrich’s goal proved to be enough and the Tigers defeated the Minutemen for their second victory in conference play. Towson’s next game is another CAA contest. The team will hit the road to face Delaware this Saturday at 7 p.m.